The Gen 2/Legacy Arms Scottish Dirk’s grip is made from a 1 piece solid handle hand carved to look like twisted wood, with mild steel accents. The blade is made from 5160 tempered carbon steel with a full tang. 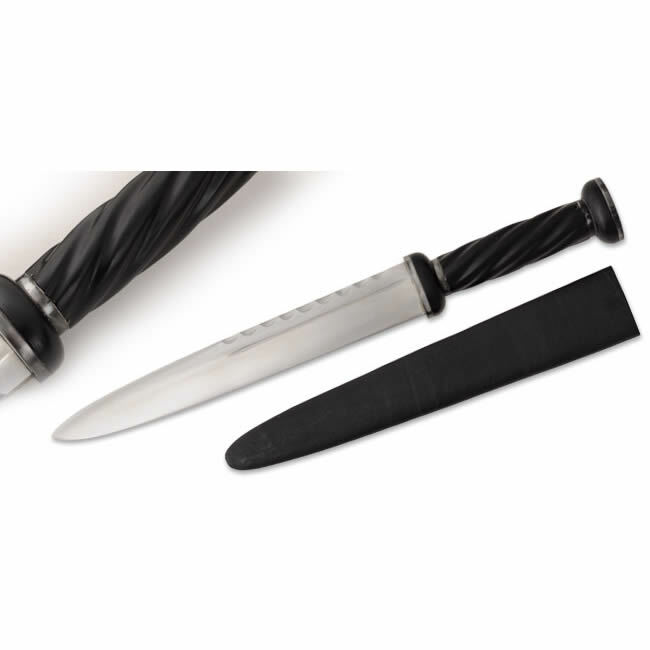 The scabbard is wood wrapped in black leather. The early Scottish dirk was a direct descendent of the medieval ballock dagger. The grip form began to change, probably sometime in the 16th century, but soon developed a form that was purely Scottish. The later versions that are quite popular, are somewhat debased in form, and not the pure fighting weapon of the early version. And make no mistake about it… this dirk was a pure fighting knife, and unabashedly so. Key Features: Full tang construction One piece solid wood handle Wood core scabbard included Overall: 18 1/4″ Blade Length: 12″ Weight: 1 lbs. 8.5 oz. Point of Balance: At Ricasso Specs will vary slightly from piece to piece.